Darwin Micheal Mejia, right, holds hands with his mother, Beata Mariana de Jesus Mejia-Mejia, following their reunion at Baltimore-Washington International Thurgood Marshall Airport. The Justice Department agreed to release Mejia-Mejia's son after she sued the U.S. government in order to be reunited following their separation at the U.S. border. "The last I saw of mother," one read, "she was standing on the gallery crying." 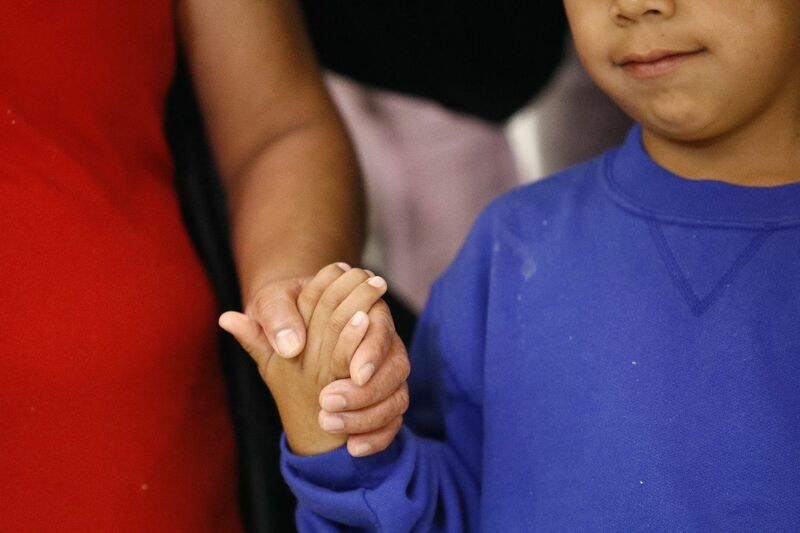 It's just evidence, said Giesberg, a history professor at Villanova University, that an American policy of taking children from their parents — reversed by President Trump on Wednesday but not without lasting repercussions — is nothing new. "People were saying, this was not America and we don't do this in America," Giesberg said. "We do, and we always have." For almost 250 years, enslaved African American children were ripped from their mothers' arms to be sold. Starting in the late 1800s, American Indian children were sent to boarding schools far from their homes to learn the ways of white society. Henry Fernandez, a cofounder of the African American Research Collaborative and a senior fellow at the Center for American Progress in Washington, sent a tweet at the end of May comparing historical events to current events. It went viral. "I think that at the core of this identification with the immigrants" for African and Native Americans in particular, he said, "is something visceral and familiar. " To white slave owners in America, slavery was merely about economics, said Heather Andrea Williams, a University of Pennsylvania professor whose book Help Me to Find My People: The African American Search for Family Lost in Slavery, was published in 2012. Enslaved people were sold from their families to cover debts or to redistribute the wealth to survivors after a plantation owner's death. But to those families who saw their loved ones sold, the grief, sorrow, and, in some cases, depression or mental illness lasted for decades, Williams, who teaches Africana studies, and other researchers say. Williams quoted from the autobiography of Charles Ball, a fugitive slave and Navy veteran, where he described being ripped from his mother's arms at age 4, when he had been sold at a market. "My poor mother, when she saw me leaving her for the last time, ran after me, took me down from the horse, clasped me in her arms, and wept loudly and bitterly over me," he wrote. According to Ball, another man intervened, "snatched me from her arms, handed me to my master and seizing her by one arm, dragged her back towards the place of sale." Years later, Ball said, "Young as I was, the horrors of that day sank deeply into my heart, and even at this time, though a half century has elapsed, the terrors of the scene return with painful vividness upon my memory." As Williams watched news reports of immigrant children sent far away from their detained parents at the border in Texas, she said, she couldn't help but worry if, like Ball's experience, the families would ever be reunited. "I'm very concerned about that, in our moment, how they are going to put these families back together," she said. Through Williams' research, she has found stories of former slaves and their search for family members in letters, journals of white slave owners, census records, slave narratives, autobiographies and newspaper ads. For up to 50 years after the Civil War ended, formerly enslaved African Americans placed "Information Wanted" ads in black newspapers around the country. In one case, Thornton Copeland placed an ad in the Colored Tennessean in Nashville in 1865, about 21 years after he had been sold away from his mother. "Information is wanted of my mother, whom I left in Fauquier county Va., in 1844, and I was sold in Richmond, Va. To Saml. Copeland. I formerly belonged to Robert Rogers. I am very anxious to hear from my mother and any information in relation to her whereabouts will be very thankfully received. My mother's name was Betty and was sold by Col Briggs to James French .… "
In another ad from 1865, a mother sought out her two sons. "Information is wanted of my two boys, James and Horace, one of whom was sold in Nashville and the other was sold in Rutherford County. I, myself was sold in Nashville and sent to Alabama by Wm. Boyd. I and my children belonged to David Moss … Charity Moss. " An ad from Last Seen: Finding Family After Slavery, a website created by Villanova University and Mother Bethel AME Church. Williams said many white slave owners dismissed the idea that black families had strong emotional ties to each other. Thomas Chaplin, a slave owner in South Carolina, had written in his journal in 1845 after selling 10 of his 70 slaves to cover a debt brought about by lavish entertainment: "The Negroes at home are quite disconsolate but this will soon blow over. They may see their children again in time." Giesberg, the Villanova professor, is collaborating with Mother Bethel A.M.E. Church in Philadelphia to maintain the online database of newspaper ads launched last year called "Last Seen: Finding Family After Slavery." She warned that the progress the country has made needs to be guarded. "We're not the same country we were when slavery was legal. There are constitutional protections in place. We've had an entire civil rights movement," she said. "All those protections are there, but we have to be vigilant about how fragile those institutions are. But it feels like those protections are being chipped away."